The Pomo date back about 3,000 years on the North Coast. They built their main village of redwood bark houses at the mouth of Big River. The Pomo hunted large and small game, caught fish and shellfish, and gathered seaweed, acorns and various seeds. Whatever they could not obtain locally, they acquired in trade with other groups; in times of plenty, native groups often gathered to share the bounty. When Russian and Aleutian fur trappers arrived here in the early 1800s, they were likely the Pomo’s first contact with non-natives. When the Pomo were drawn into the mission system in the early 1800s, their way of life was forever altered. Within a generation or two, direct conflict and exposure to European diseases nearly decimated them. Today about 5,000 Pomo descendants, who still occupy parts of their ancestral lands, gather the raw materials to make some of the world’s finest Native American baskets and to pass on this ancient skill to the next generation of artisans. Between 1864 and 1893, lumber operations were Little River’s commercial foundation. That changed after the panic of 1893—a five-year economic depression that hit the American West particularly hard. By 1900, the Little River mill operation was completely shut down. Van Damme State Park was named for Charles Van Damme, who was born at Little River in 1881, son of early settlers John and Louise Van Damme. John Van Damme and his wife were a Flemish couple. The patriarch of the family was born in Bredene, Belgium on May 22, 1832. "Following the sea" for some years, Van Damme, upon his arrival in Mendocino County, later worked in the lumber mill at Little River. In this settlement all of his children were born, including Charles, whose love for the area prompted his acquiring, after some years as a successful operator of the Richmond-San Rafael ferry line, a plot of ground along the redwood coast. Upon his demise this area became part of the State Park System in 1934. In those early days lumbering was a major economic factor in the development of the northern coastline. Little River was built as a mill town in 1864 by Ruel Stickney, Silas Coombs, and Tapping Reeves after the property, formerly called Kents Cove, was purchased from W. H. Kent in 1862. Before long it had attained fame, not only as a lumber port, but as a shipyard. A stand of redwoods, if logged, does not last forever; by the end of the century, even though logging was periodically moved back into the headwaters of Little River, the mill was forced to close in 1893. What was left of Little River soon deteriorated: the shipyard, the wharf, the town, several chutes for loading lumber, and the lumber mill itself. Activity at the port, which once bustled, declined. Little River's school, attended by nearly 100 students at its most populous, closed; weekly steamship service ended, and a shipyard where Captain Thomas Peterson had turned out full-size lumber schooners for the coast-wide trade, phased out. Only the schooner Little River returned, to be wrecked on the very beach from which it originally departed. Plagued by a lack of sufficient timber reserves, fires, substantial loss of business and trade, deterioration of the port's chutes and wharf, the end of coast wide shipping and the attendant decline in population, Little River reverted to a natural state. Its acquisition by the State Park System in 1934 and the subsequent addition of peripheral lands has preserved some of California's most interesting natural resources. The Civilian Conservation Corps (CCC) was a government program that employed thousands of young men during the Great Depression. These men lived and worked in camps throughout the U.S. developing national, state and local park facilities. 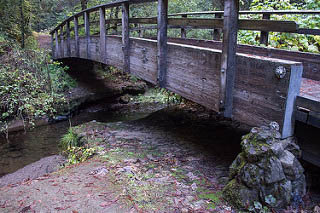 In the later 1930s and early 1940s, many crews camped in Russian Gulch and worked in this canyon building campgrounds, trails, and a road, now called Fern Canyon Scenic Trail, along Little River. All CCC camps followed an important guideline—that the park areas were to be kept as natural as possible by blending man-made features into the natural landscape. For example, the rocks used for the culverts and some of the retaining walls along Fern Canyon Scenic Trail were chosen for their rough surfaces, size and color. Whenever possible, their moss or lichen-covered surfaces were utilized. The CCC built nine concrete and stone fords over the Little River. They were designed to allow spawning salmon to swim upstream. But by the 1990s, scientists had determined that the stream crossings were keeping fish from their spawning grounds. Park planners had to make a difficult decision: keep the historic fords, or support the fish population by removing them. If you hike the Fern Canyon Scenic Trail, you will see the final resolution. The middle sections of all the stream crossings were removed, except one which did not cause as many problems for the fish. The ends, including rock work, were left, and attractive bridges were built over each old stream crossing. Trailside panels share the story of the salmon and the CCC.